It’s summertime – the king of all seasons for getting outdoors and living it up in your outdoor living room. 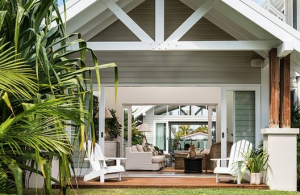 The kids are on holiday, the beach beckons, your favourite ice cream is calling and outdoor living, dining and entertaining doesn’t get any better than this. 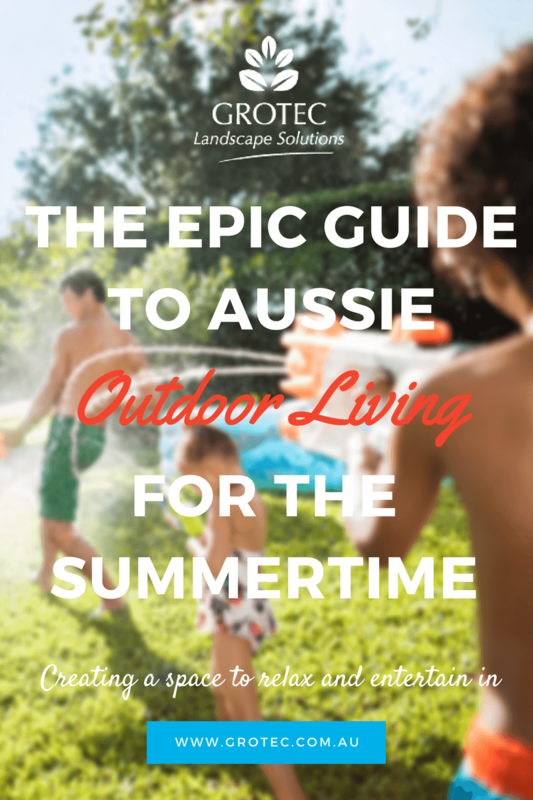 Australians have always “lived” outdoors and the concept of Outdoor Living is now a rapidly growing lifestyle phenomenon. What is Outdoor Living? It means bringing all the comforts of indoor living to the outdoors. 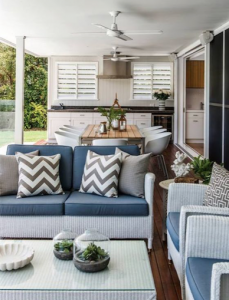 A well-designed outdoor living room has the potential to add value to your property and to enhance your lifestyle, so make the most of it and don’t waste any undue time and money doing a less than special job! Overhauling your outdoor living room requires the same forethought as any other room in your house. Your garden space is an asset – so whether you are overhauling from scratch, or just making some modifications – you should plan well and plan carefully. Today, we have an incredible selection of products to make outdoor living one of the most pleasurable aspects of owning a home. According to a survey of home builders, a patio or deck is one of the top three features most requested of new home buyers. Homeowners are building stone patios with outdoor kitchens complete with large, permanently installed BBQ’s, refrigerators and work areas. They’re installing luxurious outdoor fireplaces or fire pits to extend the season, adding beautiful outdoor lighting to extend the evening; They’re even installing televisions, stereos and artwork specially made to be weather-proof. The outdoor living room is about family and friends. Where comfort and conversation rule. It is a space that is designed for spending time with those who matter most, giving us that unique space to interact, exchange and connect. Generally, your outdoor living area should echo the colours and style of your interior spaces for true harmony to be achieved. Integrate the accent colours from rugs and cushions inside with cushions and decor outside. Introducing a feature colour into flowering plants is also a stunning way to merge the two spaces. Whether you’re having a romantic dinner under the stars, or a quiet breakfast overlooking your garden, an outdoor dining area can be filled with a charm we cannot replicate inside. Outdoor dining rooms can be casual, even laid back, and at other times refined and elegant. Savour the open air and transform your setting to suit your event. Many of us, at some point in time, will find ourselves daydreaming of ways to improve, refresh or change the space we live in. 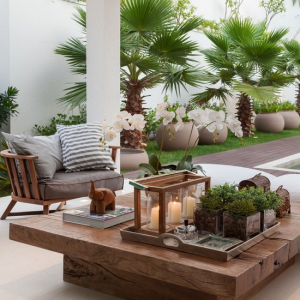 Before you get your hands dirty, spend a bit of time planning what you want to achieve in your outdoor living room! There are many things you can do to breathe new life into a tired space, some more drastic than others. Your decisions will be influenced by your budget, the value-add to your property and the direct benefit to you. Whatever scale of work you choose to undertake, the process is similar; and the more time you spend initially researching and planning is time and money saved in implementation. Consider the assistance of an experienced landscape designer to help you pull your ideas together. A scaled landscape design plan can be prepared which will help you to see how the space works with the proposed elements to be introduced. A variety of concepts can be considered, budgets can be determined and ideas can be changed during this planning phase. Without a plan, changing your mind throughout the construction process could cost you thousands! To keep the kids entertained so you can relax, we can integrate ideas for them too! If the kids want to play outdoors, but the grass is not holding up to the wear and tear… or the heat… it might be worth considering artificial grass. Artificial grass is usually associated with tennis courts and sporting fields as being short, spiky and bright green; however longer, softer, more lush-looking versions of synthetic grass are now available and they look superb. Synthetic grass can be used where real grass won’t grow, over hard surfaces like concrete or over rubber as soft-fall in children’s playgrounds. It is a flexible solution to many applications… and it never needs to be watered or mowed! Think of your favourite summer holiday and chances are there is fresh air, sunshine and water involved. Remember playing under the sprinkler as kids or hosing off the sand and salt after a day at the beach? Perhaps your best summer memories are heightened by luxurious resorts or bathing in private waterholes far away from civilisation. 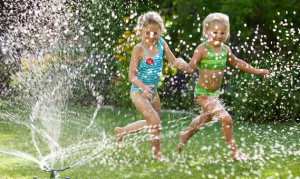 As humble or extravagant as these ponderings may be, an outdoor water play area brings the best of the season directly to your backyard. All you need is a creative idea, some water, and some drainage that diverts water to the garden and and you’re in business! Today, there is almost nothing that you can do inside your home that you can’t do outside. Enjoy Outdoor Living this Summer or plan your ideas for the next. Grotec’s Landscape Design team can help you plan your Outdoor Living Area and the Landscaping construction team can help you build it! Check out Grotec’s ‘Outdoor Living’ board on Pinterest for more inspiration. Click here!